It is a river probably most famous for its tidal bore - a wave that builds and returns to the sea - surfers taking the strange opportunity of surfing one of England's rivers. The River Severn, near Worcester, also has significance for me. When I was a child I had a print of a British landscape painting on the lounge room wall of my family home. Thinking for many years that it was a reproduction of a Constable painting it wasn't until the research opportunities of the internet, and a keen interest to track down the painting, that I discovered it was the River Severn. Little did I know that I would be led on a journey that would take me to Worcester, the River Severn, and the exact spot where the painting was originally sketched in 1882. As a child my mother and I would look at the print and exchange stories. It shows the banks of a river, a barge and a village in the background. Looking at the barge, where a woman appeared to sit, my mother would comment, "Look they are cooking their dinner." A little puff of smoke could be seen rising from the barge's chimney. We would create stories, interacting with the painting. The sky appeared darker. Was a storm coming? Were other boats coming down the river? What was happening in the village? We interacted like many people do with paintings - accepting it as part of life, building a fiction, seeing it as a living entity, as part of the family. An increasing curiosity, and the appearance of the internet, boosted my chances of researching this painting. Looking closely at the print, and seeing the name BW Leader, I was able to track down the origins of the work - a small village in Worcester - Kempsey. Little did I know that I would soon be meeting a major expert, visiting the artist's hometown and standing on the actual bank where the painting was done. Benjamin Williams Leader (1831-1923) was a painter famous for his scenes of Worcester, a style that included everyday subtleties such as water on paths, puddles and reflections of the sky. As the art historian Ruth Wood states - 'some of the wettest paintings in British art.' His famous paintings include February Fill Dyke which can be seen at the Birmingham Museum and Art Gallery. Leader was born with the surname of Williams yet changed his surname to Leader to distinguish himself from other painters. He became a very popular and commercially successful artist whose works are very representative of detailed English landscapes. He was created a full member of the Royal Academy in 1898 after many years of displaying at the annual exhibition and experiencing some resentment for his commercial success. He received the a Chevalier of the legion of Honour from the French in 1889 and was given the Freedom of the City of Worcester in 1914 in recognition of his services as a director of Royal Worcester Porcelain and as a native of the city. Leader lived his early years in Diglis House, now the Diglis Hotel, in the shadows of the fabulous Worcester Cathedral. In 1859 he moved to Whittington Lodge, just outside Worcester, until 1889 when he moved permanently to Surrey. The Cathedral can be seen in a number of his paintings as can the small nearby Claines Church. Visiting Worcester I couldn't help but feel that I was in the grasp of the artist. I had a similar feel when visiting Flatford Bridge for the first time - the home of Constable's most famous painting. I felt as if I was stepping into a Constable painting, the site being quite eerie. With the lovely assistance of Ruth Wood, author of the most significant book on Leader's life and work, I was able to intensively research the painting whose print hung in my childhood home. 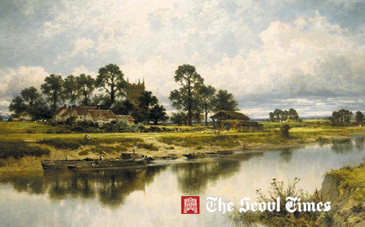 What became apparent was the fact that at least several versions of this painting exist: the most famous being that which was exhibited under the serious and symbolic title of Severn Side, Sabrina's stream at Kemsey on the River Severn, at the Royal Academy in 1889. This appears to have been privately sold by the Richard Green Gallery in London in recent years. The print on my family wall dates back to 1883, based on a sketch made in the previous year at the side of the river. Called Kempsey Church on the River Severn it sold for £135,000 at Christies in 2000. All appearances are that it is in private hands as it does not pop up in gallery listings. A smaller copy of Sabrina's stream was also made in 1889. It sold for £85,000 in March 2000 at Sotheby's. Engravings were also made shortly after 1889. Why were there so many versions? The reason is simple: Leader operated in a commercial world and he was occasionally commissioned to paint scenes. If a certain painting was admired a copy was created - the slight movement of buildings, sheep, boats, figures, etc, adding to the uniqueness of the work as well as the copyright. What is apparent with the family painting is its subtle difference to the more famous academy work: the barge is facing the other direction, the scene is more wintry. So, on a warm afternoon, and with the aid of an ordinance map Ruth, her friend Terry, and I, made our way to the edges of the Severn, the 12th century St Mary's Church Kempsey slowly coming into view. My excitement rose as the view appeared increasingly like the painting. And then we were there, at the banks of the river, overlooking the original scene - the church in the background, the village itself, the beautiful river. Swifts darted across the river, sheep bleated in nearby fields. A storm was starting to build. What was apparent were the changes to the area: The boat mooring across the river, the increased trees on the banks and the subtle changes in perspective - the artist having shifting objects in order to create balance and feel within the work. I picture Leader as he does his preliminary sketch in 1883. Travelling from Worcester, with the aid of a boy servant, a cart and horse, he probably followed the banks of the river until he finds the perfect spot for sketching - the sides of the river being cleared of vegetation as ropes and horses are needed to pull barges. I picture Leader, the darting swifts, the slow river currents. The mood from that era that is still quite perceptible as roads are still some distance - many British rivers are still tranquil backwaters. I pick up my sketch pad, the memories of the journey and symbolically follow the cart, the horse, Leader and the boy servant as they make their way up stream in the failing light of the day. The Beatles Again -- in Osaka, Japan? Mr. Darron Davies, who serves as a special correspondent for The Seoul Times, is a freelance writer based in Melbourne, Australia. He is a photographer: www.darrondavies.com and works as a specialist in education supporting creative teaching within schools : www.inclueded.net.